Are you planning a wedding that is full of personal details, DIY centerpieces, or make it yourself decor, but need some major advice so the end result doesn't leave guests saying, "what the...?" Meet Brittney and Alex. 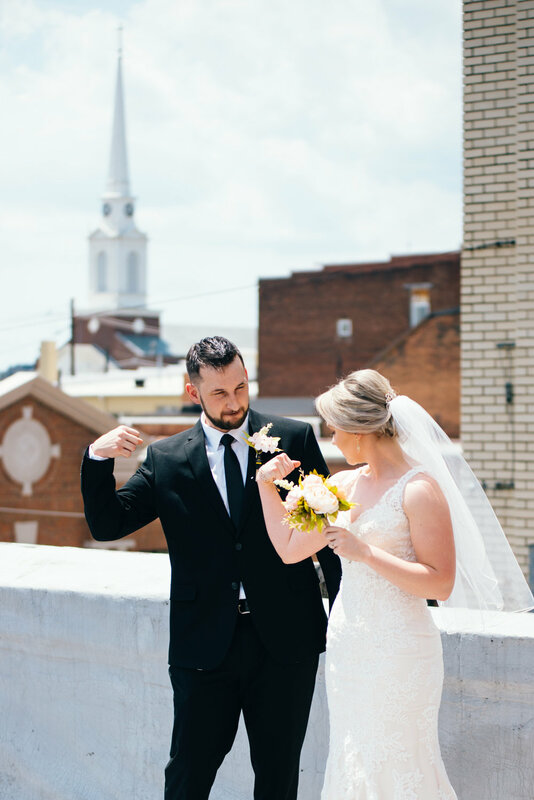 This super fun couple loves all things Disney, superhero, Netflix, and pop culture - just to name a few - and were determined to have a wedding that felt like a party but was still infused with personality! Everything about their day, down to choosing the venue, was carefully curated to be totally "them." Even their dogs were a part of the ceremony! Dexter the ringpupper and Hazel the flower dog totally stole the show (and the awesome ceremony was literally a show, complete with choreography, stage lighting, and theater curtains)! So how can you learn from their months of planning, crafting, and creating their pop culture themed wedding and make it fit YOUR theme? Brittney and Alex were kind enough to answer some questions about the entire process, including sharing some helpful resources, and got honest about the big questions they had to ask themselves when deciding what direction to go! I hope you find her wisdom invaluable as you plan your own totally unique wedding! Q: How did you incorporate your personality into your details? A: Alex and I both love our pop culture references, getting down to a funky beat, and entertaining. We truly believe a wedding should be a celebration of who the couple is, both together and separately. When we took on the idea of having a pop culture wedding, many ideas flowed through our minds (Pinterest didn't hurt either!) and when realized we had so many TV Shows, Movies, Games, and Characters we loved, why not feature them at their own table? We took that idea one step further and tried to match our family and friends to the themes they would enjoy and it couldn't have worked out any better. Hours upon hours were spent scouring flea markets, garage sales, the internet, and my parents attic crawl space to find old toys and games. The outcome was everything we wanted, and more. As for our ceremony, this was going to be the happiest day of our lives and we wanted our music and surprise movie trailer to showcase that! Don't be afraid to think outside the box! When your groomsmen take it upon themselves to sway back and forth on the stage like N*Sync backup dancers to the processional, you know you've done a good job. Q: How did you choose what interests of yours were important enough to incorporate? A: The two of us sat down together and made a list of our interests, both common and otherwise. Upon determining what size wedding we wanted, we were able to decide how many tables and in turn, what themes would make the cut! We knew right away the themes that were most important to us, Disney, Batman, Harry Potter, and Marvel were priority and from there we chose based off of our guests. This day was about them too! Everyone joining us in one way or another has shaped us into who we are and we wanted to celebrate them as well. What a joy it was to see the reactions as our guests walked around to see the other themes. It also helped the guests who didn't know each other to mingle a little more. Q: What was the biggest challenge for making DIY elements? A: First things first... Pinterest at some point in your life will do you dirty. You will think you're Martha Stewart. Some of you may be. I'm a pretty good crafter but Martha I am not. Alex and I wanted to incorporate wine bottles as vases because they're a super affordable option, aka free from friends and family who like a little wine in the evening. We thought we were doing a good thing by painting them months in advance and an article on Pinterest told us how to store them. A few weeks out from the wedding we unpacked them to take a peek. Surprise! Most of them had pretty decent scuffs and paint chips - enough that they would need to be painted all over again. So much time down the drain! But, here comes my dad out of nowhere to the rescue with custom wine bottle labels he designed himself! We covered some of the scuffs with the labels, turned the good sides facing out on the rest and just like that, no wasted time. Another DIY challenge was the fact that we wanted to have actual toys or trinkets at each table. While this made our theme really shine and our guests had some props to play with (you know who you are) I don't know if either of us will ever get the grime off from sticking our arms elbow deep in totes of old McDonald toys at flea markets. Q: What were some helpful resources you discovered while creating your details? A: As I mentioned earlier, think outside the box. Like far outside the box. I'm pretty sure the two of us took a high speed train from the box and never looked back. Point is, make the wedding about the two of you. We have never been fans of "normal wedding food" so we decided on a gourmet burger bar. We've received dozens of compliments on how great our food was already! Alex and his groomsmen are all pretty big super hero/comic nerds so their boutonnieres featured their favorite lego characters. The two of us we so set on our name being on a movie theater marquee and because of that, we made amazing friendships through Amplify Church. It was a chance meeting after I googled "Indiana movie theater" and found out there was already a church where we wanted to get married! Also, don't be afraid to showcase the things you love. You will get odd looks if you choose to have a unique wedding. Try explaining to people that you're having a Game of Thrones table and you need 300 thumbtacks to make a dragon egg or that somehow purchasing the Sorting Hat from Harry Potter makes sense for your wedding. They won't see your vision until they walk into the room. But they also won't soon forget your wedding. Q: What advice do you have for brides to encourage them to be as unique as they want? A: Above all, enjoy the process! We had a longer engagement than most couples and it allowed us to get every detail just the way we wanted and also allowed us the time to get everything accomplished without too much stress. There. Will. Always. Be. Stress. It's just a matter of managing it. There will be things that go wrong, there will be people that will disappoint, there will be ideas that fall short of expectation, and there will be the one thing you "couldn't live without" that you forget about until the week of your wedding. Pick the things that are important to you and build your budget around that. Flowers aren't your thing? Don't spend money on them! We realized photos and video would last forever so we made sure to budget accordingly! Our day was everything we wanted and more and that was largely because we stayed true to ourselves. We couldn't be happier with the outcome. Can't wait to see how it turned out? You will definitely not want to miss the highlights of this amazing day! Scroll on to see the "highlight reel"!